Lovers of Durosoke crooner, Olamide, partied like never before as the talented singer thrilled over 3000 guests to an unforgettable experience at the periodic mainland gig “One Night Stand” organized by Koga Entertainment. The show which came up on Saturday October 26, 2013 is fast gathering reputation and following which has led some to tagged it mainland party. Crowd at the Koga hall crossed the expected 2000 guests with statics showing over 3000 fun-lovers showed up for the event that started about two years ago. Other acts that graced the stage to give a glimpse of what to come in annual December concert, Top10 MICS were Eva, Jaywon, Ketchup, Moses (Nigerian Idol Winner 2013), Seriki, Splash, Flowsick, Phenom, Qdot and many more. One Night Stand is a periodic party-like concert by Koga Entertainment, the same production company behind the hugely popular, Top10 MICS. 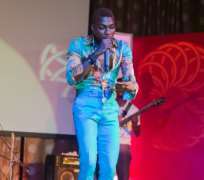 Dede Mabiakwu, Sir Shina Peters, Obesere, Terry G, Samklef and a host of others have performed at the usually-packed event. The bumper- packaged edition had Koga Open House Competition and the team of judges: Master Kraft, DJ Klem and Liciouscrackit announced Zayo as the winner of the competition beating five other contestants. Dris and Skinnie Tweed emerged first and second runners-up respectively. Koga Open House is a competition discovering the next singing superstar; this is after rigorous phases of auditions have been conducted. The panel of judges goes ahead to pick the best three that have the combination of talent, wisdom and personality. Zayo will be signed to Koga Records alongside First runner up- Dris and Second runner up Skinnie Tweed.